Sendai Castle (仙台城), also known as Aoba Castle, is ruin of the Japanese hill top Castle located in Sendai. It was built in 1601by Date Masamune. It commanded a highly defensible strategic position overlooking the city of Sendai. When Spanish messenger watched this castle, he said "This was the strongest castle I ever saw." Sendai Castle is stractured, honmaru, ninomaru, and sannomaru. 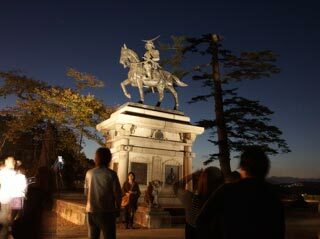 Current Castle site also contains a Gokoku Shrine, as well as a large equestrain statue of Date Masamune. At the observation area, you can see great view of Sendai City. One of the most popular travel spots in Sendai area. Sendai Castle is located on the Aoba Mountain. It was naturally protected by the cliff and Hirose River. Date Masamune who is Daimyo of Sendai designed this castle. Most of the building were lost during WWII. Right now, there are stone walls and Otemon Gate are rebuilt. Sendai Castle is very unique compare to other Castle. Otemon Gate which is the main entrance of the castle is located between Honmaru and Ninomaru, and Sannomaru is located out side of Otemon Gate. Because Honmaru is located on the top of the mountain, House of Date families are located in Sannomaru. So, Honmaru take the style of Mountain Castle, and Sannomaru is Land Castle. The castle was one of the nerve centers of the Ouetsu Reppan Domei during the Boshin War, when Date Yoshikuni was lord of Sendai. Taken over by the new government in the aftermath of Sendai's surrender, it was partially dismantled in the 1870s.